Patently Apple reports on a newly-published patent application from Apple coming out of the European patent office and revealing user interfaces offering scrollable menus and toolbars designed to handle the ever-increasing number of tools and options in many applications while limiting the amount of space required to access those options. 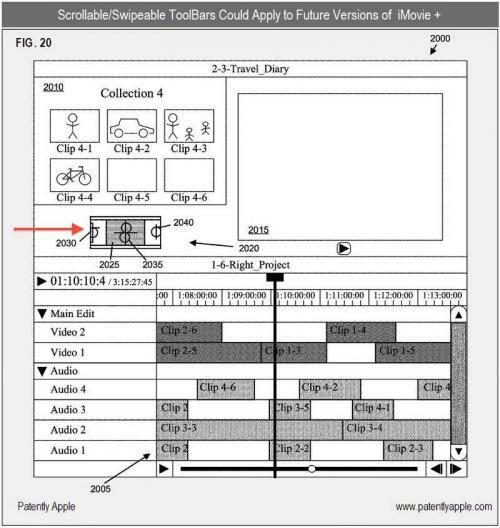 In particular, Apple's patent application describes the use of a small selection window through which a variety of options could be scrolled, rather than offering an entire toolbar with all options remaining visible at all times. 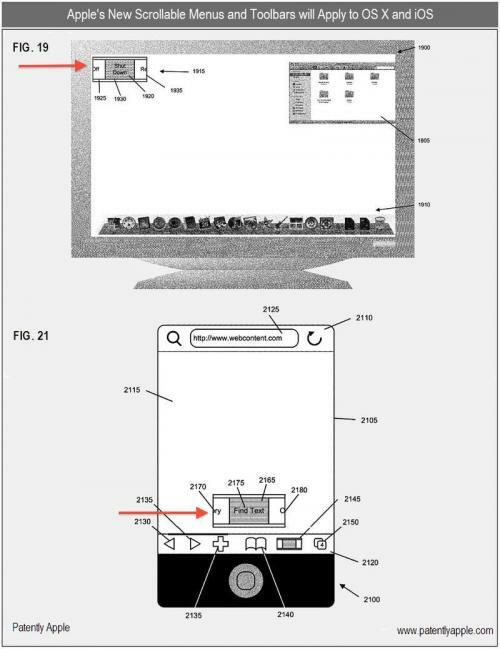 The drawings accompanying the patent application depict implementations on both Mac OS X and iOS. Apple's patent and illustrations introduce us to a new concept of scrollable menus and toolbars that may very well end up in both OS X Lion and a future iteration of iOS. The new menus and toolbars may also be integrated into future iterations of Apple applications such as Aperture and/or suite applications like Pages, Numbers and iMovie. To begin with, Apple states that their invention provides a novel method for presenting a menu in a graphical user interface. The menu includes several selectable menu items that are assigned in a particular order for scrolling through a selection window based on user input. In some embodiments, each of the menu items is associated with a command. When a menu item is in the selection window, a user could select the menu item in order to perform the command associated with the menu item. In addition to vertical and horizontal scrolling, Apple proposes other geometric organizations such as arcs and circles of icons that could permit a large number of icons to be displayed in a limited area and scrolled into position for selection.